The United States government just released its long-awaited proposed regulations to stop the commercial ivory trade within the US. These regulations send a clear message that the US will not tolerate the senseless slaughter of elephants and other wildlife—or the global crime syndicates that wildlife trafficking supports. We need to stand up and make sure these regulations fully protect elephants. This is about more than elephants: Organized crime has moved into ivory in a big way. Global wildlife crime, estimated at $10 billion annually, is increasingly controlled by the same criminal networks that smuggle arms, drugs and humans. And it's having grave consequences. Elephant populations are plummeting due to poaching. 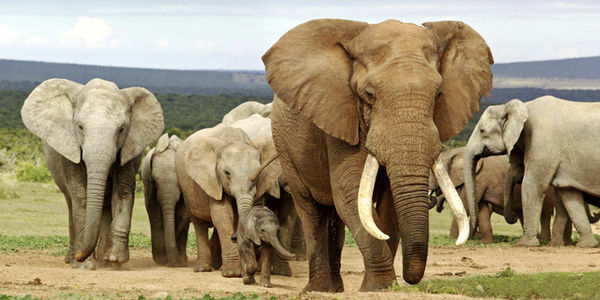 In fact, Tanzania recently announced a 60% decrease in its elephant population in the past five years. Take action and tell US Fish and Wildlife Service it is the right decision to save wild elephants. I commend the US Fish and Wildlife Service and the Obama administration for such a firm commitment to end the devastating slaughter of elephants for their ivory and to ensure that the United States is not helping to drive the illegal wildlife trade. Along with 80% of the American people, I strongly support ending commercial trade in elephant ivory in the US. I believe we must take all necessary steps to protect these magnificent creatures from extinction. Fewer than half a million elephants remain in Africa's savannas and jungles--a 95% plunge over the last 50 years. Recently, the killing has surged: Poachers are slaughtering on average one elephant every 15 minutes, and some populations are now on a path to extinction. Reports from US intelligence agencies and the UN also show that profits from ivory trafficking are fueling crime, corruption and violence in fragile African democracies and financing organizations that threaten both American and African security. America's role in the consumption and sale of ivory makes us complicit in this crisis and weakens our moral authority to lead internationally. The US is the world's second-largest market for wildlife products, and significant amounts of illegal elephant ivory have been found entering the American market. We must strengthen our laws to prevent this from happening and to encourage other countries to act with similar urgency. I thank you and others in the administration, including the president himself, for your unprecedented leadership on this issue. Combined with new US efforts to combat wildlife trafficking, the ivory rules proposed by the US Fish and Wildlife Service can help turn the tide for Africa's elephants. I share the American public's desire to halt the US role in the illegal ivory trade, and I believe that the decision to halt elephant ivory commerce in the US is the right response to the current crisis. For the sake of the world's elephants, I urge you to keep that promise.